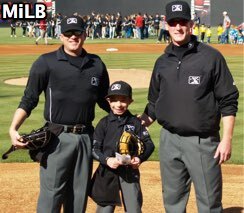 Meet 10-year-old Vincent Stio, an officiating aficionado and aspiring umpire who works his games alongside MiLB umpires near Raleigh, North Carolina, home of Minor League Baseball's Class-A Mudcats. Vince wears a full uniform, mask, bag, and plate shoes, and carries around a plate brush, just in case home plate falls prey to a few too many peanuts and Cracker Jack. You might recall our brief article on Grant from Moline, Illinois, who called balls and strikes from the stands at a Single-A Midwest League game at Quad Cities. Well, looks like he has some competition. Related Post: Starting Young - Kid Umpire Calls MiLB Game from Stands (5/13/18). Umpires Phillips (L), Basner (R), and Stio. As CBS correspondent Steve Hartman reports, Stio knows his stuff—he's trained with aspiring umpires on the field and in the cage—and calls the game alongside the on-field umpires; in this case, Reed Basner and Ben Phillips served as the on-field crew with Stio supervising from the front row, mimicking Basner's calls behind home plate. As Stio said to ESPN, "for a strike you say, 'strike,' but for a ball you don't say...you say, 'ball.'" And, as the ESPN piece continued, "when an umpire ejects a player, he's captivated." Looks like we might have found a future fan for Close Call Sports & the Umpire Ejection Fantasy League...or, perhaps, a future draft pick. 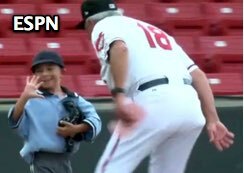 MiLB Umpire Brock Ballou first noticed Stio in the grandstand during the 2016 season: "out of my peripheral, I just saw this young kid, he had an umpire mask on, and he was calling strikes with me. I started wiping off the plate and he started doing the same thing. I've never seen that before." When Stio visited an MLB Umpire Clinic, Director of Umpire Development Rich Rieker asked the attendees, "how many people got into umpiring before they were 12?" Seeing no takers, Rieker continued, "That's you, Vince. One guy." Related Post: MLB Umpire Camp - Aug 18 in Houston (7/17/18). Stio ejects Carolina Manager Rocket Wheeler. Ballou and partner Cody Clark met with Stio after the 2016 game for some feedback: "They thought he had great mechanics, they said they loved what he was doing...that was like everything to him and he just took off after that," said mom Maria. As Basner said, "every fan we can get is a plus." Added Phillips, "Last night, there was a time somebody said, 'Put the kid in!'" Maybe one of these days, somebody will put the kid in: after all, Vincent hopes to grow up to be an umpire.